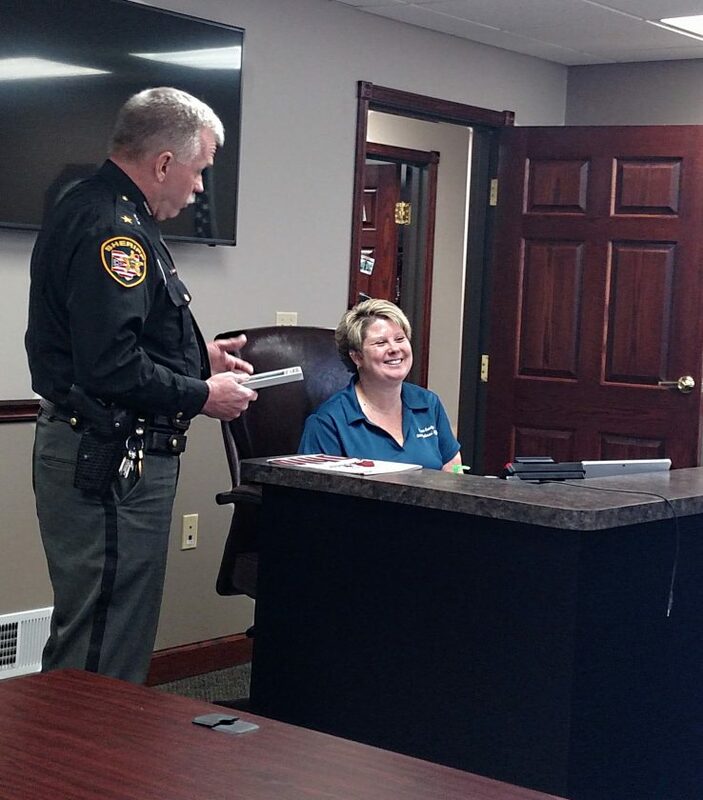 PHOTO BY VICKI JOHNSON Sheriff Bill Eckelberry served a document of appreciation to county Administrator Stacy Wilson from the county commissioners and the county office staffs she works with Thursday during the Seneca County commissioners meeting. Stacy has been with the county for 13 years and she said she has worked with 13 county commissioners. Seneca County commissioners heard a report from Kathy Oliver, director of Seneca County Job & Family Services outlining the number of children in kinship and foster care through Child Protective Services due largely to drug use among their parents. Because numbers are rising and some children need extra care and services, she said costs are rising as well. Oliver said the department investigates allegations of child abuse and neglect, works with families to ensure child safety, collaborates with law enforcement during criminal investigations, petitions courts for orders of protection or removal from home, works with foster care families and similar duties. Oliver said there were 56 children in kinship care in 2018, which was the same figure as 2017. Kinship care refers to the care of children by relatives or other people the child knows. In 2018, 25 children were in agency custody, up from 17 in 2017. Oliver said it’s likely the department will need more funding. Also related to children, the commissioners heard an update from non-profit organization CASA – Court Appointed Special Advocates – a group of volunteers trained to intercede in the role of guardian ad litem for children’s interests in court cases. “Part of our strategic plan is to meet with elected officials and let them know what we do,” said Michelle Miller, communications and fundraising coordinator for the organization. The agency works in Seneca, Wyandot and Sandusky counties. Last year in Seneca County, she said 50 children needed services. In 2017 there were 47 children and, in 2016, there were 46. “We are in the courtroom with the children,” Miller said. She said volunteers also make sure the children’s needs are met such as in school or in counseling. She said a 30-hour training session starts in April with half of it online. Anyone interested in getting involved in CASA can find information on its website, www.casaofssw.org, its Facebook page or by calling (419) 448-1442. Also Thursday, the commissioners voted 2-1, with Commissioner Shayne Thomas dissenting, to spend $2,000 on an appraisal review for property next to Seneca County Airport. The county already has committed about $4,500 to two separate appraisals for purchasing the land. If the county and land owner can make an agreement, the Federal Aviation Administration would reimburse 90 percent of the appraisal, the appraisal review and the project cost. The commissioners approved a contract with Fostoria Economic Development Corp. through 2021. They also are working to finalize a contract with Tiffin-Seneca Economic Partnership. In addition, the commissioners agreed to move forward with a project to use $78,000 in recycling grant money from Ottawa-Sandusky-Seneca Solid Waste Management District to rebuild a drive at the county cemetery. In addition to improving cemetery access, Thomas said the upgraded drive would tie in with the county’s active transportation plan, which is in the planning stages. During her report, county Administrator Stacy Wilson reported the county’s 2018 finances carryover was about $2.2 million. At the beginning of the meeting, Stacy was presented with a document and flowers thanking her for 13 years of service. Appointing special counsel for the Seneca County General Health District, retroactive to Jan. 30, to be paid from the health department budget. Contracting with Bill Jones of Re/Max Real Estate and Auction Services for the auction of 108 Jefferson St. Contracting with North Central Ohio Educational Service Center to provide staff and instruction for the Seneca County Youth Center. Authorizing a participation agreement with CCAO Service Corp. of the County Commissioner Association of Ohio for natural gas, electric services. Established a Federal Opioid Specific Grants Fund. Approved a supplemental appropriation of $840 to the Sewer District Fund – Bascom Capital Improvements. Supplemental appropriations and appropriation adjustments submitted by county offices, retroactive to Jan. 1. Authorized the sale of two cars by the sheriff – a 2009 Ford Crown Victoria, which sold for $925, and a 2005 Ford Crown Victoria, which sold for $625.